base.io is a small design studio and consultancy operated by Jørgen Skogmo. Through a strong network of friends and collaborators, base.io provides the flexibility and passion of a small studio combined with the momentum, expertise and accountability of larger entities. We work internationally by default, in teams driven by collaboration and a shared ambition to develop each project to the highest level, with the highest standard. The search for each projects unique idea often carries us into new terrain, where new (visual)languages and (software)tools must be developed to uncover the landscape and emergent (interactive)forms. We work digital and networked. The computational canvas is brought to life with custom software, sensors, interconnects, users and social interactions. We believe everything is connected and related, and that any design, color, interaction, form or space has a 'true' state. Our design process and resulting concepts is all about this discovery. Our strategies and estethics is the direct result of projecting this conceptual base into a project-specific perspective. Our projects for COP15, TV2, ZDF, Kulturværftet exectue this thinking. Increasingly, the process of the discovery itself becomes the project. The development of collaborative software-mediated environments for data interpretation and visualizations for faster time to insight. Operating small-by-purpose allows a lightweight, single-point-of-contact project setup, where the idea stays center while the project moves through conceptual thinking, data-modeling and user experience driven interaction design and merge with system architecture and software programming to form clear interactive identities and conceptually rational and strong communication. 2011 /KL7 Director of Digital, Copenhagen, Odense, Aarhus. shiftcontrol is a copenhagen based design studio founded by Jørgen Skogmo and Patrik Svensson in 2006 to focus on exploration of next-generation digital concepts, interaction design and research. 2004-2006 Office for Metropolitan Architecture, Junior Architect, Rotterdam, NL. Working primarily with Rem Koolhaas' "Think Tank" AMO's projects for Italian fashion house PRADA on numerous media-related installations and exhibitions. Key projects include design and development of digital content for the Los Angeles 'epicenter' store, procedural graphics for the WaistDown exhibition, "behind the scenes" documentary about the PRADA Perfumes short movie, exhibitions in Tokyo, Shanghai, Berlin, London, New York and Los Angeles. 2004 TV2 Danmark, Odense, DK. Concept, design and development of the on-air identity for Denmarks largest commercial TV station in collaboration with TV2Design. I developed a software application that generates the on-air breakers ("Præsentations design") in real time. 2003 Collaboration with Tomato Interactive on the Tomato Global Workshops. The Tomato Global Workshops is a design course/workshop in which students collaborate, develop and critic design ideas online after being kicked-off by a one week intensive workshop. I developed the web community software to facilitate the process. For the project Mobiglobe produced for Autostadt in collaboration with HOSOYA SCHAEFER Architects and Unity Studios. The awards ceremony took place at the Berlin Konzerthaus on October 18, 2013. For the project "Universum der Ozeane" produced for and with ZDF in collaboration with HOSOYA SCHAEFER Architects and Unity Studios. The awards ceremony took place at the Berlin Konzerthaus on October 7, 2011. The project "Universum der Ozeane" produced for and with ZDF in collaboration with HOSOYA SCHAEFER Architects and Unity Studios won Gold in the iF Awards 2011. 861 entries from 27 countries. The awards ceremony took place at the BMW Welt in Munich on March 18, 2011. The project "Universum der Ozeane" produced for and with ZDF in collaboration with HOSOYA SCHAEFER Architects and Unity Studios won Bronze in the Nordmedia Nordmedia Serious Games award 2011. The groundbreaking information visualizations built with the Unity game engine awarded us a profile in Apple's exclusive Pro section (Via archive.org). To-date, shiftcontrol is the only Nordic company to have received such honor. 2006 Lead Teacher, Dept. of Interactive Media, Designskolen Kolding, Kolding, DK. Working directly with the dept. head Elle-Mie Ejdrup Hansen, we developed the curriculum and direction of the 2006 year. 2006 'Factory' workshop, Dept. 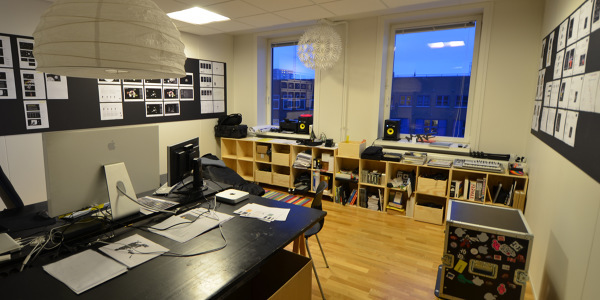 of Interactive Media, Designskolen Kolding, DK. Fast paced iterative design course aimed at shortening the process between design research and final product/idea. Co-organized with Andrew Griffin (JDS Architects), Guest appearances by Rasmus Koch and Magnus Gabrielsen. Fast paced production and teamwork workshop for 50 students from Interactive media, Graphic Design and Illustration. 2000 Presentation on "Recent Nordic work within Interaction Design", Design INDABA, Cape town, SA. Part of the 2nd New Media Underground festival. 1999 Presentation, Digital Garden, NO. 2000 - 02 : Designskolen Kolding, Master Degree, Interaction Design, Kolding, Denmark. 2000 - 01 : The Kaospilots, Internship, Aarhus, Denmark + Durban & Cape Town, South-Africa. 1997 - 99 : Designskolen Kolding, Bachelor Degree, Interaction Design, Kolding, Denmark. 1995 - 96 : Oslo Fotokunst skole, Fine Art Photography, Oslo, Norway. 1993 - 95 : University of Oslo, National Geography, Oslo, Norway. 1980 - 93 : Rudolf Steiner School, Oslo, Norway.